A recent Bloomberg article looked at the US car rental industry and how the rationale for consolidation over the last decade has been to improve profitability through firmer pricing, with benefits to shareholders coming at the expense of the consumer. The reasoning behind this thinking is that the airline industry in the US has gone through a period of significant consolidation with recent improvements in airline profitability serving as a guide and precursor for what is likely to become the outcome and consequence of consolidation in the car rental industry as well. How does this intuition stack up versus reality? There is no doubt that the car rental industry in the US has consolidated significantly over the last decade and it is clearly a very concentrated industry, e.g. 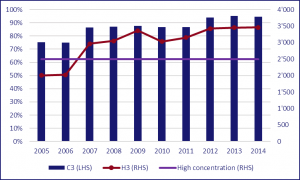 as measured using the Herfindahl index, as seen in the following chart (note: C3 = market share of top 3 operators, H3 = Herfindahl index of top 3 operators). There is limited concrete evidence that consolidation has had a significantly negative impact on the consumer as measured by pricing. The impact on industry wide pricing seems moderate at most and available data and recent comments from the major, listed operators do not paint a picture of an industry where the suppliers are grabbing power from the consumer. 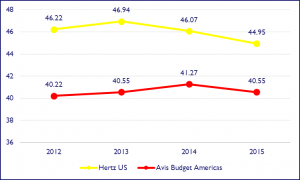 Avis Budget and Hertz being two of the three major operators in the US market, and the only ones for which there is meaningful publicly available data and KPIs for the US/ (North) American market (Enterprise, the market leader, being a private company), include revenue per day (“RPD”) as part of their financial reporting and investor communication. Below is a chart summarizing their respective RPD for their American/ US operations for the period 2012 through 2015. Given the strong seasonality of the car rental business, looking at the quarterly RPD in USD terms does not create a clean picture. It is, however, of interest to analyze year-on-year development. Available data (scope and reported segmentation etc) on a quarterly basis goes back to 2013, so a year-on-year comparison is available for the Q1/14 onwards, with the findings summarized in the below chart. The quarterly data is obviously directionally aligned with the annual data. 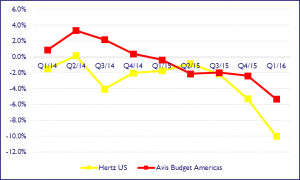 Thus, it is not surprising that Avis Budget saw a year-on-year RPD increase every quarter in 2014, but went negative throughout 2015, whereas Hertz has only seen one quarterly increase in average RDP, Q2/14, in the period. The most interesting take-away is the acceleration of the decline in average RPD in the latter part of 2015 and early 2016, with RPD pretty much falling off a cliff in Q1/16. In short, this does not seem representative of an industry where the consumer is being squeezed! There could, and there are, logical reasons behind this trend of pricing pressure, a major one being a change in business mix from premium brands (Avis, Hertz) to more value (Dollar, Thrifty, Budget) and deep value (Payless, Firefly) oriented brands, which obviously impacts the average price. An important point to make is that there are options available to the consumer even post-consolidation. That there are three groups or holding companies with a combined market share in excess of 90% does not necessarily mean that the market has been cornered as competition can take place both on a vertical level, e.g. premium vs value offerings, and a horizontal level, i.e. between brands. Segmentation is a key component in the product and service offering in the travel industry. The airline industry uses various classes, e.g. economy, business and first, to segment their customers, with the objective being to extract as much benefit from various categories of clients as possible. Another example is the hotel sector where operators like Marriott, Accor and Intercontinental, to mention but a few, all offer a wide range of brands targeted at different segments in the market. Thus, there is no particular reason why the car rental industry should be any different to its travel industry peers in supplying a differentiated product to customers with specific needs and requirements. Another issue is that the car rental industry as a whole sees competition from alternative providers of mobility solutions. Ride-hailing (Uber, Lyft being the most prominent), ride-sharing (e.g. the French success story BlaBlaCar), car sharing (though it can be argued that this represents a segment in car rental and most operators have a presence there), taxis and public transportation (trains, buses, metros etc) all represent viable alternatives to renting a car. In the case of ride-hailing, there is some evidence, possibly more circumstantial than conclusive (see this recent article of mine on this topic) that some of the growth comes at the expense of car rental. Accordingly, the 90%+ share of the car rental market held by Enterprise, Hertz and Avis Budget actually represents a smaller share of a much larger pie, i.e. the mobility space. This is a significant difference with the aviation industry since, as per today and until the Hyperloop arrives, there are no real alternatives to air travel in many cases, e.g. when going from coast to coast in North America. Accordingly, the impact of car rental pricing from consolidation may deviate from what intuition and theories suggest and the airline industry consolidation playbook and impact may not necessarily be transposable to the car rental industry. Accordingly, whereas one could have expected that prices would go up in the wake of consolidation, there is limited, if any, evidence of this being the case. Developments external to a narrowly defined car rental industry causing downward pressure on car rental prices have proven stronger than the impact of a more concentrated industry. Thus, as a consequence changes in the broader market space, the expected car rental pricing impact from consolidation has not materialized. The experience in the US car rental market post-consolidation is an important lesson to keep in mind when looking at the potential for consolidation in the European car rental space (I have covered this topic in a previous article as well as a white paper) in that consolidation and increased industry concentration does not necessarily mean higher prices for the consumer. There are a broader and more generic implications as well, e.g. when competition authorities analyze proposed M&A transactions, in that one should exercise care when defining the relevant scope of the market when analyzing the potential impact from a transaction as depending on how one defines the market, e.g. in this case car rental or mobility, the outcome and results may prove counterintuitive, though ex-ante analysis versus ex-post verification is an obvious issue. The key take-away, however, remains that available evidence points to car rental pricing in the US not having developed as one could have expected when consolidation started about a decade ago. Nicolay Nedrelid is Founder & Corporate advisor at Nedrelid Corporate Advisory, an independent strategy and strategic planning consulting boutique focused on the car rental industry based in Geneva, Switzerland.